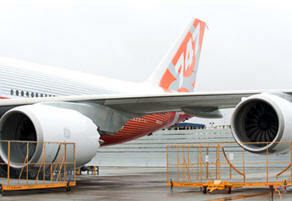 March 9, 2011 - Boeing successfully completed the first engine runs for the 747-8 Intercontinental on Tuesday. The milestone marks a key step in preparing Boeing's largest-ever passenger jet for flight test. "The integrated airplane systems and engines performed as expected," said Elizabeth Lund, vice president and deputy program manager of the 747 program. "This result allows us to continue moving forward to first flight." Engine runs began at 11:57 a.m. (PST) Tuesday and lasted approximately two hours and 45 minutes. During initial engine runs, the engines are started and operated at various power settings to ensure all systems perform as expected. The engine run test began with the Auxiliary Power System providing power to start the first of four GE GEnx-2B engines. The remaining three engines were started using the cross-bleed function. Basic systems checks continued throughout the test. The engines were powered down and inspected and will be restarted following a technical review. The team completed a vibration check and monitored the shutdown logic to ensure it functioned as expected. The GEnx-2B engine is optimized for the 747-8. The new engine contributes to a reduction in fuel burn, emissions and noise, which gives customers the lowest operating costs and best economics of any large passenger airplane while providing enhanced environmental performance. The Boeing 747-8 is a wide-body commercial jet airliner being developed by Boeing Commercial Airplanes. Officially announced in 2005, the 747-8 is the fourth-generation Boeing 747 version, with lengthened fuselage, redesigned wings and improved efficiency. The 747-8 is the largest 747 version, the largest commercial aircraft built in the United States, and the longest passenger aircraft in the world. The 747-8 is offered in two main variants: the 747-8 Intercontinental (747-8I) for passengers and the 747-8 Freighter (747-8F) for cargo. The first 747-8F performed the model's maiden flight on February 8, 2010. Delivery of the first freighter aircraft has been postponed multiple times and is now expected in mid-2011; passenger model deliveries are to begin in late 2011 or early 2012. In December 2010, orders for the 747-8 totaled 107, including 74 of the freighter version, and 33 of the passenger version.